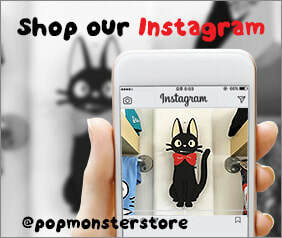  5 benefits of shopping at pop monster. our customers have loved about Pop Monster. store in reliability and customer service. cart, which is not available at single brand shop. community, so you can shop their exclusive items. toys based on our established community.  What can you expect from our newsletter? Since 2007, our newsletter has been a primary communication channel in our local business and has been beloved by our customers. Until now, we still keep this tradition and our newsletter covers a lot more variety of items and events for our local customers than what are available online. That's why we strongly suggest to subscribe to our newsletter.  Why do we post only selective items online? We now live in the era that too many merchandises are flooded all over the place, especially online. So, the key now is the SELECTION. So we only sell the selective few coolest items online, which are picked out of hundreds of items in our physical store.  How to order the items from our instagram. to check the posted items are available there. with price and shipping info.  How to checkout an international order. click <international shipping> option, then complete the order without paying the shipping first. 2. We'll quote you the shipping fee by e-mail thereafter. 3. You can pay the quoted shipping fee from your Paypal account individually.  Have A Special request?